This course is the second practical part one you have completed our online training module. This accredited qualification provides learners with skills to further their first aid training. It is recommended for first aiders in the workplace environment who have access to a defibrillator. Those gaining this qualification will know that cardiopulmonary resuscitation and automated external defibrillation form an essential part of the chain of survival. All successful students will be issued with a Cardiopulmonary Resuscitation and Automated External Defibrillation Certificate, along with a wallet-sized plastic card detailing their achievement. 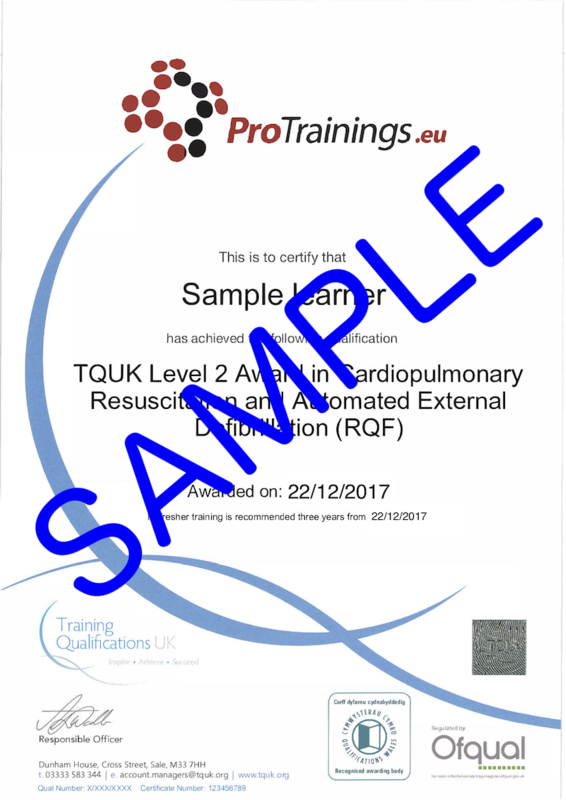 To comply with current requirements in the medical, dental, care sector and to meet the AED recommendations of the UK Resuscitation Council guidelines, you must take this qualification again after one year. Please contact ProTrainings for further information. Learning Outcomes once both this online and the practical module have been completed.